The chiefs made this declaration on Saturday 9th February, 2013, during the funeral service of their late colleague, H.R.H. 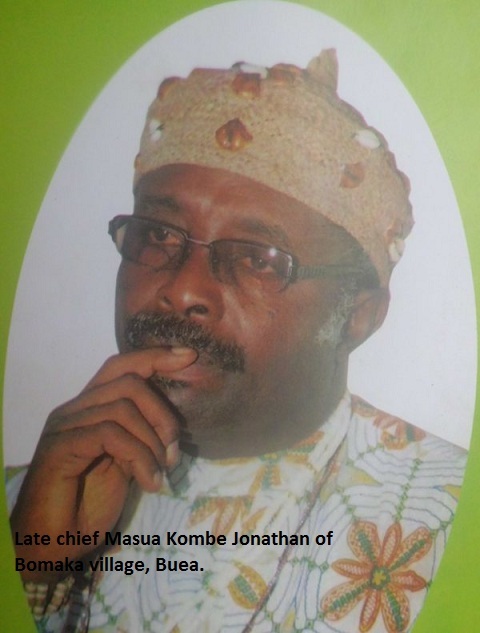 Chief Masua Kombe Jonathan. Noting that there is a lot of wrangling affecting chieftaincy in Fako Division, the chiefs called on the entire Bomaka village and anyone who has interest in the chieftaincy stool to stay calm until the Divisional Officer for Buea subdivision holds consultative talks with the chief-makers for a new chief to be made. The deceased was enthroned Chief of Bomaka on the 6th of May 2010. Before his death, he was an employee of the Limbe City Council since December 1, 1988. Late Chief Masua was born on 13 November, 1958, in Bomaka village. He died on January 21, 2013, leaving behind a wife, children, grandchildren and family members and friends to mourn him.